If you’re a regular reader of our game articles, you might have noticed there is one type of game we usually avoid. We’ve had plenty of strategy, abstract, puzzle and card games, but absolutely nothing from one of the most success categories of the past few decades – trivia. It isn’t because we don’t like them, it’s a problem inherent in most games of this type; it is difficult for adults to play with their kids because one group will have a much better knowledge of the categories. 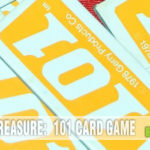 And in our Thrift Treasure searches, trivia games quickly show their age with outdated topics. A few nights ago we attended a local trivia night with some friends and realized that trivia has become much more than just “read a question and try to answer”. Technology has allowed for the playing of songs, snippets, photos and even video clips as part of the competition. Yet our experiences with trivia games designed for the home have all followed the same tired model of “draw a card, read it and answer”. 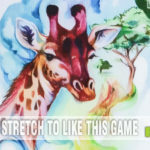 That is until we came across Pop Stream by Spin Master Games. 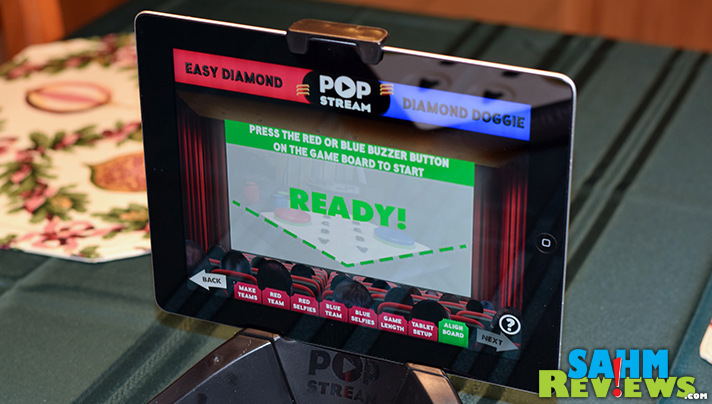 Pop Stream is unique in that it uses your tablet as the game’s primary ‘board’. Sure, there are plenty of trivia apps, but this is so much more. 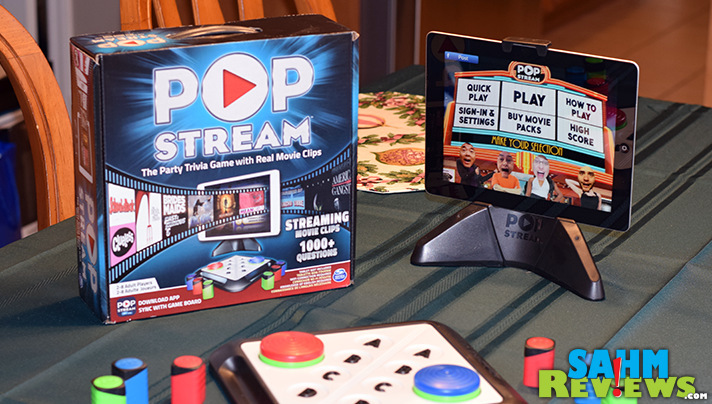 Pop Stream uses your tablet’s camera to watch an included Buzz-In Game Board. 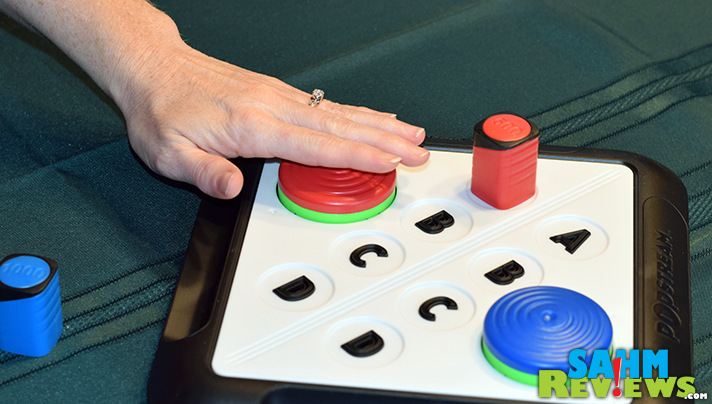 It senses which answer is selected and when the buzzer is pressed by either team in real time! 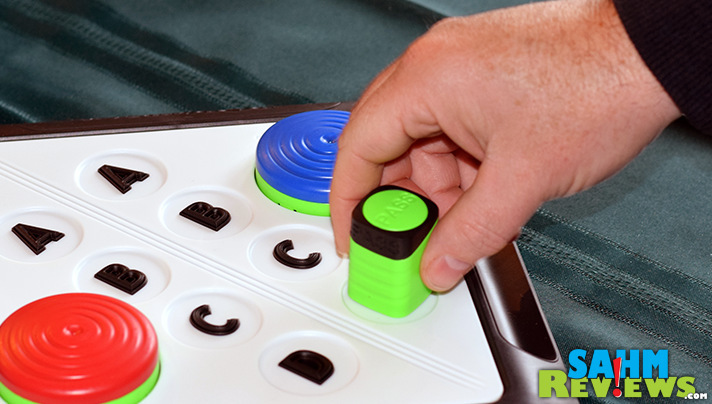 I just mentioned the problem with older trivia games – the questions quickly become outdated. Because all of the games’ questions are asked via the free app, this is no longer an issue. A quick update to the app might contain more than just bug & security fixes, it may include completely new questions and challenges! And because this is a trivia challenge that is solely about movies, there are always new Hollywood titles that can be added to the game. 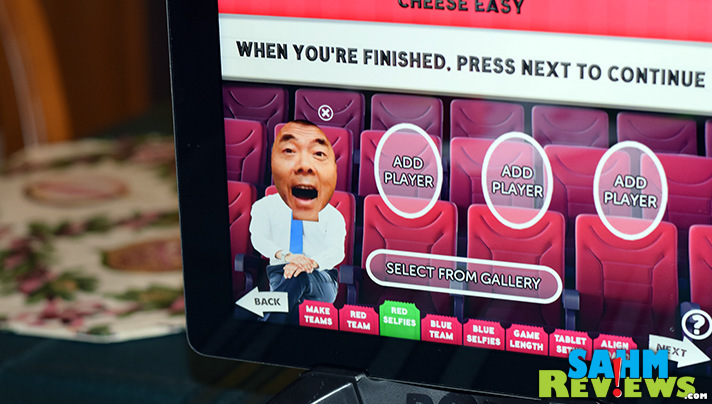 Streaming movie clips, photos with superimposed player faces and standard text questions are just a few of the trivia categories you’ll face. At the beginning of each game you can select the length in rounds, number of players and even make custom avatars with the exact faces of the people you’re playing with! Pop Stream is played as teams with both teams acting at the same time. When it comes time to answer you have a couple choices. You might choose to answer by placing a ‘bet’ on your team and hitting the buzzer. The number of points you win will be determined by the strength of your wager. Or…play it safe and choose to pass by playing that token and buzzing it. Then your opponent will have a limited amount of time to place their bet and answer! Great for when you have no idea of the correct response, as when a team misses, the other team gets an opportunity – but now with one of the multiple-choice answers already eliminated! So who is this game good for? Because it is played in teams, the problem of adults vs. kids is eliminated (although expect some fighting over the parents). Thanks to updates, the questions should never be stale. This puts Pop Stream squarely in the family and party categories of games. 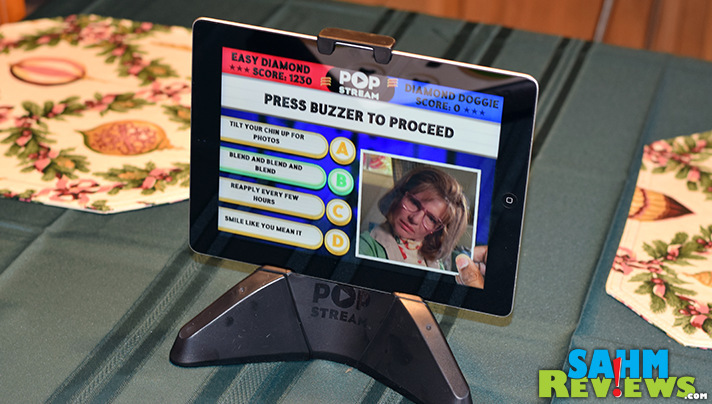 At under $30, Pop Stream is substantially cheaper than admission to your local trivia nights. Purchase direct from Spin Master via their web store, or look for a copy on Amazon or at your local retailer. Grab your tablet, invite some friends over and see who really was paying attention when they took their wives to see the latest Nicholas Sparks movie! 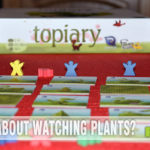 Do you play trivia games? What is your best category? This looks like a fun game for families. This would make a good holiday gift this season. This looks SO fun. I can never get out for trivia nights (I blame the kids)… I would love to play this! This looks like a super fun game for the whole family. I love trivia games. We played a game similar to this recently and it was so much fun! Oh fun! We love playing trivia games. Especially my husband – he’s very competitive. My kids and husband love trivia. I have to tell them about this so they can have a competition! This sounds like a perfect game for our family and friends. We have several game nights set up this winter and I like how this trivia game doesn’t use the outdated trivia questions from our stockpile of games. 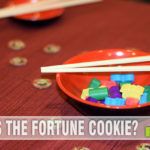 This looks like loads of fun!We love trivia games here and this seems right up our alley. This game looks so much fun to play. I will have to pick up a copy yo play with my kids on the holidays. I love that they’re coming up with new and unique ways to use tablet devices! This looks like a lot of fun! This looks like it would be a super fun game to play.